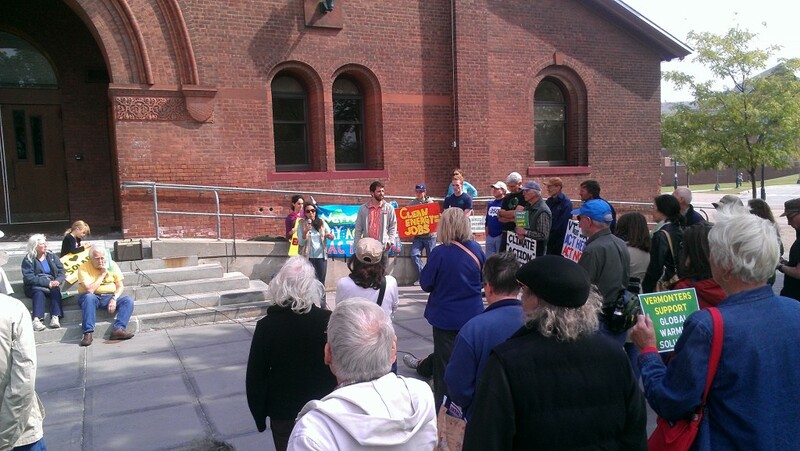 In preparation for tomorrow’s worldwide People’s Climate March, Jasmine and I attended a small rally in Burlington at the University of Vermont’s campus. We heard impassioned speakers, some young, some old, talking about how we desperately need to work together, not merely as Vermonters or as Americans but as citizens of the world, to make sure that we have a livable planet to bequeath to our grandchildren. There’s reason for hope. Eight years ago, the largest climate rally in the world happened in downtown Burlington: 1,000 people attended. Not that many people were talking about climate change back then. Tomorrow, between 100,000 and 200,000 people are expected in Manhattan at the People’s Climate March, with thousands more in similar mobilizations around the globe. People are starting to pay attention. In eight years, talking about carbon sequestration and footprints has gone from nutjob territory to a familiar topic at dinner tables and in classrooms across the world. Sustainability is gaining leverage in economic terms as well as moral ones. Last week, my friend Jay O’Hara‘s trial (for blockading a coal port with a lobster boat) was essentially dismissed, setting precedent for direct actions around the country. It’s going to take work to fix the climate. Some of the options are already off the table because we’ve delayed too long, and the longer we wait, the more doorways get closed. One of the speakers this afternoon pointed out that Americans tend to mistrust expert opinions and place their faith in the hands of people they know—friends and family members. As a society, our opinions are shaped by those closest to us. They asked us to commit to talking to at least one other person, today, about climate change and the need for action. So I am talking to you. I believe the evidence I’ve seen about climate change. I believe that without significant changes in the way we live, work, eat, travel, and build, our grandchildren are going to inherit a world that’s actively hostile to life the way we know it. I don’t want that stain on my soul. The way I see it, we’re going to need a lot of people talking and working, together, if we’re going to fix this problem. It’s already happening, but we need more. For that to happen, silent moderates need to participate in the discussion. It’s okay to say you’re not sure how big the problem is, and it’s okay to say you don’t know what to do about it—but stand up and take part in the conversation. We need more voices. If you can get to NYC tomorrow (Sunday, September 21st, 2014), please consider attending the People’s Climate March. There’s more information here. With luck, the world leaders attending the United Nations climate summit (a few blocks away from the March route) will pay attention to the voices of the people assembled there. We speak the loudest when we speak together. Finally, I’d like to ask you to talk about this article with someone, and to do it today. You don’t have to agree. You can call me an alarmist moron if you want. But talk about it. Talk about the climate. Talk about what rising sea levels mean for island nations, and what it’ll do when Boston and NYC and Miami lose 50% of their land area to the sea. Talk about what a world without maple syrup will taste like once maple trees die off due to climate change. Talk about how we’ll respond to hurricanes like Irene and Rita when we don’t have any gasoline left to power emergency vehicles and generators. Talk about drought and superstorms and the connections between the two. And most importantly, let’s talk about what we’ll do about it all.